This image of Saturn was generated by the Solar System Simulator. It views the planet from Earth December 15, 2010 at 00:00 UTC (5:00pm PST 12/14). Five of Saturn's seven brightest moons are shown. 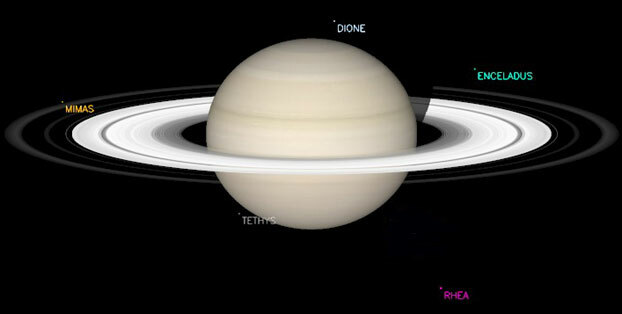 The 7 brightest Moons are: Titan, Dione, Rhea, Tethys, Enceladus, Mimas, Iapetus. Saturn's rings are opening, revealing more and more of their northern face. Saturn's ring tilt is 9º in the beginning of December and 10º by December's end. Saturn brightens as it approaches Earth and its rings open to reflect more light. The planet reaches opposition and is at its best April 3, 2011. NASA's Cassini spacecraft has been orbiting Saturn since 2004. Saturn rises in the morning sky at 2:45am in the beginning of Sagittarius and at 1:30am by its end. By the time dawn's early light appears, the planet lies almost half way to the zenith in the southeastern sky. As the days unfold, watch Saturn climb higher before dawn. The Lord of the Rings lies in the constellation of Virgo the Virgin above Virgo's brightest star, Spica. Our eyes see Spica's blue-white light (magnitude 1.0) and Saturn's yellowish glow (magnitude 0.8) shining at the same level brightness. A brighter golden star, Arcturus, lies to the north (left) of Saturn and a much, much brighter Venus lies below to the east. Look for the waning Crescent Moon near Saturn December 1, Wednesday. 12/1 5am Map and to the right of Venus December 2, Thursday. 12/2 6am Map Click Moon Dances for an additional map with meditative reflections. The Venus Climate Orbiter "AKATSUKI" (PLANET-C) is the world’s first planetary meteorological observation satellite to unveil the mysteries of wind on Venus. It will explore the mechanism of the Venus climate by observing the atmospheric movement and cloud formation process. Ultimately, this mission aims to deepen our understanding of the formation process of the Earth’s environment and its future by comparing Venus and the Earth. For more details about the AKATSUKI, please check the following site. BTW: Akatsuki means "Dawn" in Japanese. Venus at magnitude -4.9 is easily mistaken for a UFO as it hovers above the southeastern horizon. This gorgeous luminous planet rises at 4:00am in the beginning of Sagittarius and at 3:30am by its end. Its light pierces the morning twilight, begging you follow it into the daylight sky. Will you give it a try? Venus blazes at its brightest now, technically achieving greatest brilliancy December 4. However, you won't notice any change in the planet's brightness during Sagittarius. Note: Venus is the third brightest celestial body after the Sun and Moon. It is 25X brighter than Sirius our brightest star. Why is it so bright? It is the closest planet to Earth. And its white sulphuric cloud filled atmosphere reflects over 75% of the sunlight striking it. December 2, Thursday, the Crescent Moon is elegant to the right of Venus. How many celestial bodies can you identify surrounding this planetary goddess of love? 12/2 6am Map ~ 12/2 5:30am Map Click Moon Dances for an additional map with meditative reflections. Venus has phases like the Moon. You can see this demonstrated in APOD's animation of the phases of Venus. Also check out this montage, which shows Venus approaching inferior conjunction in 2004. Venus, now well passed its inferior conjunction of 10/20/10, is moving away from Earth toward the far side of Sun and its Full phase. During Sagittarius, morning Venus waxes to a 40% illuminated Crescent. Review this image/text from the Scorpio edition (10/23-11/22) of The Night Sky. The following explanation of the above image came from Astronomy Picture of the Day. Mercury's surface looks similar to our Moon's. Each is heavily cratered and made of rock. Mercury's diameter is about 4800 km, while the Moon's is slightly less at about 3500 km (compared with about 12,700 km for the Earth). But Mercury is unique in many ways. Mercury is the closest planet to the Sun, orbiting at about 1/3 the radius of the Earth's orbit. As Mercury slowly rotates, its surface temperature varies from an unbearably cold –180 degrees Celsius to an unbearably hot 400 degrees Celsius. The place nearest the Sun in Mercury's orbit changes slightly each orbit — a fact used by Albert Einstein to help verify the correctness of his then newly discovered theory of gravity: General Relativity. 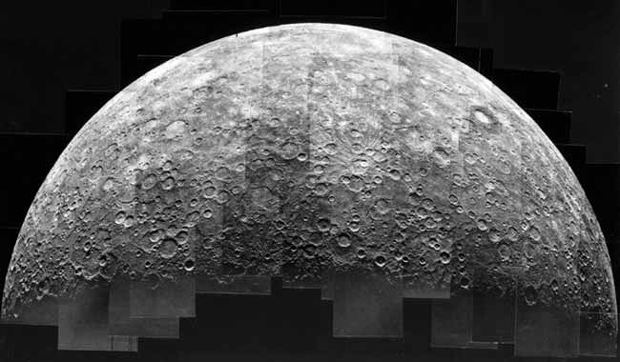 The above picture was taken by the first spacecraft ever to pass Mercury: Mariner 10 in 1974. NASA Sends a MESSENGER to Mercury! This is NASA’s first trip to the planet in 30 years. Mercury continues to hug the southwestern twilight horizon. You'll need right timing, clear skies and a flat unobstructed view to spot the elusive planet. Mercury shines at magnitude -0.4, bright enough to see at dusk, however binoculars are helpful in spotting the planet. About 30 minutes after sunset, late November and early December, look for Mercury low on the southwestern horizon where the Sun has set. Map Best views of the closest planet to the Sun occur at its greatest elongation, the nights of November 30 and December 1. At this time we see the planet at its furthest distance from the Sun's glaring light for this apparition (21º). The following, though challenging observations, have the potential of wowing the observer. December 6, Monday, bring along binoculars to catch a glimpse of the youngest, slimmest Moon below Mercury. 12/6 4:30pm Map BTW: 12/6 the Moon occults (hides) "invisible to the naked eye" Mars 4:46pm EST, 1:46pm PST, 09:46 UT. Tuesday night, December 7, a 2-day slim Crescent lies above the Mercury. 12/7 Map/Text Afterwards Mercury rapidly sinks out of sight. Mars, Mercury and telescopic Pluto reside in the constellation of Sagittarius during the sign of Sagittarius; click Moon Dances for meditative reflections. Mercury messenger of the gods, retrograde December 10-29, is moving backwards into the morning sky! The planet reaches inferior conjunction December 19 when it switches from the evening to the morning horizon. A shift or change in direction begins to take place now. ... the first 11 days of the retrograde are designed to herald in latent intuitive information that is usually in conflict with the way you thought things would play out in regards to your agendas. This conflict is the precursor of the chagrin we so commonly associate with this astrological cycle. Mercury moves back through the constellation Sagittarius and exactly conjoins our Galactic Center December 20, about 20 hours before the exact Solstice Full Moon. During this potent retrograde it helps to replace reason with intuition in order to comprehend the truth of the greater whole. Open your intuitive ears! Listen to the guidance of new incoming energies. Allow old patterns to break up. Surrender and maintain. Mars too close to the setting Sun and too far from Earth is too dim to see during Sagittarius. 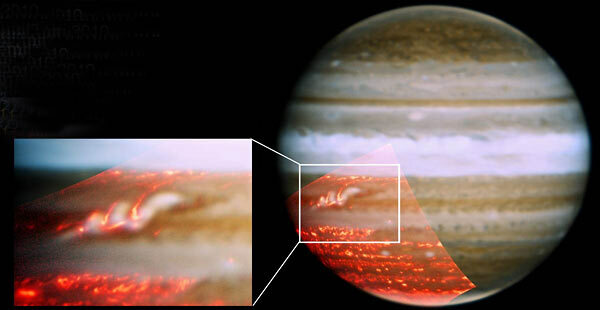 Why are planet-circling clouds disappearing and reappearing on Jupiter? Although the ultimate cause remains unknown, planetary meteorologists are beginning to better understand what is happening. Earlier this year, unexpectedly, Jupiter's dark Southern Equatorial Belt (SEB) disappeared. The changes were first noted by amateurs dedicated to watching Jupiter full time. The South Equatorial Band has been seen to change colors before, although the change has never been recorded in such detail. Detailed professional observations revealed that high-flying light-colored ammonia-based clouds formed over the planet-circling dark belt. Now those light clouds are dissipating, again unveiling the lower dark clouds. Pictured above two weeks ago, far infrared images -- depicted in false-color red -- show a powerful storm system active above the returning dark belt. Continued observations of Jupiter's current cloud opera, and our understanding of it, is sure to continue. Jupiter's southern stripe vanished in May, 2010. For a "Before and After" picture see Big Mystery: Jupiter Loses a Stripe. The "SEB Revival" is now well underway giving Jupiter a new look almost every day. The storm that is revealing the "lost" South Equatorial Belt has grown dramatically since late October. Jupiter is eye-catching in the south about 30 minutes after sunset. It is brilliant enough to be seen before the sky darkens. How early can you spot the planet? Use landmarks at nightfall to locate the planet at dusk or earlier the following day. Our gaseous giant, traveling further from the Earth, is dimming and shrinking in size. However, at magnitude -2.5, it remains the brightest point of light in the night sky until it sets around 1:15am in the beginning of Sagittarius and at midnight by its end. Only the Sun, Moon and Venus are brighter than Jupiter. Jupiter is now moving easterly toward its companion planet, Uranus. They will be in exact conjunction January 4, 2011. Early January Finder Chart Uranus at magnitude 5.8 can now be seen with binoculars and without an optical aid in a dark sky. December 10-16 Jupiter and the waxing Moon are a visual treat. Stay tuned for a Moon Dance link with a map and meditative reflections. December 13, Monday evening, Jupiter, the First Quarter Moon and Uranus are in close proximity at the circlet of Pisces. 12/13 8pm Map December 16, Thursday, Jupiter reaches quadrature. Viewing Jupiter with a telescope promises to be an adventure. Any size telescope will reveal Jupiter's missing South Equatorial Belt or perhaps the "SEB Revival" ... the return of the missing stripe! In addition, seeing nearby Uranus with a telescope or binoculars is a special 2-for-one planetary treat! Both planets, still relatively close to Earth, also lend themselves to better than normal observations. The four Galilean Moons, the largest and brightest satellites of Jupiter can be seen in a dark country sky with binoculars. They appear starlike on either side of the planet. With a telescope you just might see one of these cast a shadow on the Jovian cloud tops or disappear into the planet's shadow and then reappear in full brightness. Ophiuchus the Serpent Bearer also known as Aesculapius, the first doctor of medicine has the reputation of being the "thirteenth constellation" of the zodiac. Each year from November 30 to December 17 the Sun journeys through its southern regions. Each year, as November ends and December begins, the Sun spends a substantial amount of time transiting the legs of Ophiuchus, hence the claim it is the "thirteenth constellation" of the zodiac or the tenth Sun Sign. 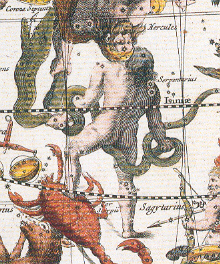 The legs of Ophiuchus lie in sidereal Scorpio. Ophiuchus is knowledge holder over the raw creative forces governing life and death--one who has attained ascension from the lower-order forces that perpetuate our scenarios of (re-incarnational) entrapment. Ophiuchus is exemplar of one who has mastered the initiatory forces of life and who has brought the interplay of these forces to a greater spiritual fulfillment. The neck (Unukalhai) and head of the snake embody the essence and wisdom of living true to soul, in one's true self-mastery--as a Christed (soul infused) being of light. Note: As our Sun transits this area of the sky November 30 through December 17, take time each day to feel its warm rays touching you with the healing energies of Ophiuchus. BTW: A new lunar cycle begins December 5 in Ophiuchus. Click Moon Dances for a map and meditative reflections. Winter's Orion rises in the east as the cosmic Scorpion disappears below the western horizon. The following mythology tells us why. Orion the Hunter, a heavenly cosmic giant, is easy to spot. He emerges and towers above the eastern horizon about 8:00pm local time during the first two weeks of December. His illustrious starlit belt helps one navigate the winter sky. Click the link below to learn more. we are all essentially Divine. acknowledge and act on this truth. spiritual beings having human experiences. each other create the Kingdom of Heaven on Earth. Happy "Thanks Giving" throughout all the seasons! The Winter Solstice occurs December 21, at 3:39pm PST (23:39 UT). This is considered the shortest day of the year for those north of the equator. It's the time when the Sun appears at its southernmost point in its path around the sky. How do the paths of the Sun and Moon differ? What is the spiritual significance of the winter solstice? Participate in solstice global meditations. The December Solstice seeds the new spiritual year for this planet. It prepares humanity for the outpouring of the Wesak energies. Learn the Significance of the December Solstice. Join SouledOut.org in a high meditation ritual. Mercury continues to hug the southwestern twilight horizon. You'll need right timing, clear skies and a flat unobstructed view to spot the elusive planet. Mercury shines at magnitude -0.4, bright enough to see at dusk, however binoculars are helpful in spotting the planet. Best views occur at its greatest elongation, distance from the Sun (21º), the nights of 11/30 and 12/1. Late November and early December, about 30 minutes after sunset, look for Mercury low on the southwestern horizon where the Sun has set. Map Bring along binoculars to catch a glimpse of the youngest, slimmest Moon below Mercury 12/6 and a 2-day slim Crescent above the planet 12/7. These are challenging observations. 12/6 4:30pm Map ~ 12/7 Map/Text Mercury sinks out of sight and is in inferior conjunction 12/19. It reappears in the morning sky late December. Mercury is retrograde 12/10-29. Jupiter is eye-catching and easily seen in the south about 30 minutes after sunset. How early can you spot the planet? Jupiter, moving further from the Earth, is dimming and shrinking in size. However, the gaseous giant, shining at magnitude -2.5, remains the brightest point of light in the night sky until it sets around 1:15am in the beginning of Sagittarius and at midnight by its end. Jupiter is now moving easterly toward its companion planet, Uranus. They will be in exact conjunction 1/4/11. Uranus at magnitude 5.8 can now be seen with binoculars and without an optical aid in a dark sky. Jupiter and the waxing Moon are a visual treat the week of 12/10-16. Jupiter, the First Quarter Moon and Uranus are in close proximity 12/13 at the circlet of Pisces. 12/13 8pm Map Jupiter reaches quadrature 12/16. Saturn rises in the morning sky at 2:45am in the beginning of Sagittarius and at 1:30am by its end. The planet lies almost half way to the zenith, in the southeastern sky, by the time dawn's early light appears. Brighter Arcturus lies to the north (left) of Saturn, Spica directly below the planet and blazing Venus below Spica and to the left. 12/1 look for the waning Crescent Moon near Saturn. 12/1 5am Map 12/2 the Crescent Moon lies to the right of Venus. 12/2 Map The planet shines at magnitude 0.8, a bit brighter than Spica at magnitude 1.0. As the days unfold, watch Saturn climb higher before dawn. Saturn's telescopic rings are tilting open, revealing more and more of their northern face. The planet's ring tilt is 9º in the beginning of December and 10º by its end. Saturn's Rings 12/15 Generate images of Saturn's ring tilt as seen from Earth with the Solar System Simulator. Our ringed planet is getting brighter as it nears Earth and the rings open to reflect more light. The planet reaches opposition and is at its best 4/3/11. Venus rises at 4:00am in the beginning of Sagittarius and at 3:30am by its end. Its light pierces the morning twilight, begging you follow it into the daylight sky. Venus blazes at its brightest now, achieving greatest brilliancy 12/4 at magnitude -4.9. 12/2 the Crescent Moon is elegant to the right of Venus. How many celestial bodies can you identify in the vicinity of Venus? 12/2 Map Venus has phases like the Moon. You can see this demonstrated in APOD's animation of the phases of Venus. These phases and more can be seen in this 2010 Evening Animation of Venus. Also check out this montage, which shows Venus approaching inferior conjunction in 2004. During Sagittarius, morning Venus waxes to a 40% illuminated Crescent. Vega is the brightest star in the northwest setting at 11:00pm in the beginning of Sagittarius and by its end at 9:00pm. It is the western point of the Summer Triangle, which is slowly sinking on the western horizon giving way to the autumn stars overhead. Altair is the triangle's southern point and Deneb the eastern point. The Great Square of Pegasus is a sure sign of autumn. Look for the four stars almost overhead as night begins. Autumn Stars ~ Autumn Dipper? A Flying Horse?.